How is one of the most desirable handcrafted hunting weapons by Peter Hofer in the world created? 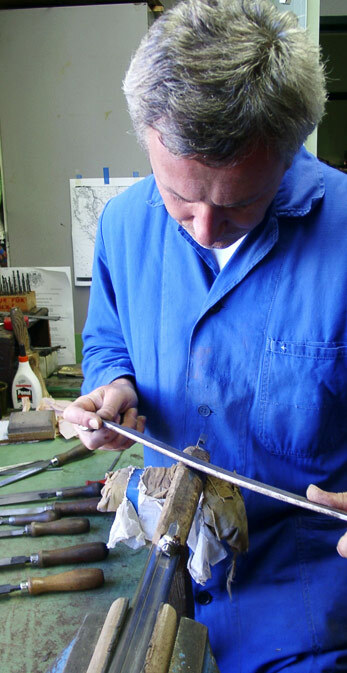 The manufacturing process of hunting weapons handcrafted by Peter Hofer begins in his head. Talent and the urge to create absolute perfection guide his gifted hands while a unique work of art is composed from the many million possibilities - as unique in the world as the future owner of the newly created Peter Hofer hunting weapon is. Peter Hofer has always known how to draw international attention and interest to his weapons, with elegance, clarity and self-confidence, with good design that makes itself useful in the best sense. A Peter Hofer weapon is created almost entirely by hand. There is no machine as perfect, intuitive and reliable as the people who produce the hunting weapon masterpieces in an almost unlimited technical range according to the 500-year old tradition of craftsmanship in Peter Hofer's workshop. Since the construction of a hunting weapon by Peter Hofer can take several years, Peter always makes an effort to have a small collection of extraordinary masterpieces readily available for his very special customers. For those who can buy themselves anything - except time!